This is a photograph of a giant boulder on top of another giant boulder. And by another giant boulder we mean Comet 67P/Churyumov-Gerasimenko. 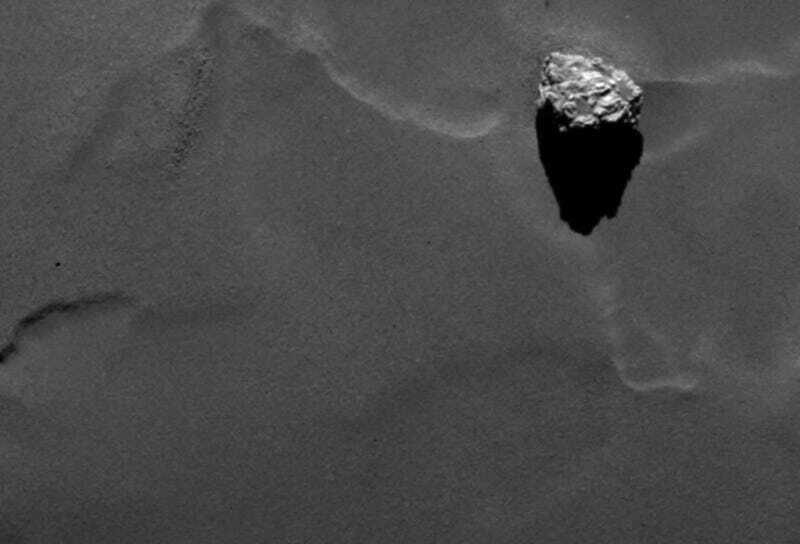 The image was captured by Rosetta's OSIRIS narrow-angle camera from a distance of 17.7 miles (28.5 km). Yay, finally a high-resolution image of the comet's' surface. The ESA's Rosetta team have dubbed the rock Cheops. It's about 147 feet (45 meters) at its widest and is the largest structure within a group of boulders located on the lower side of the comet's larger lobe. The cluster reminded the scientists of the famous pyramids at Giza, so they named this rock after the largest of those pyramids, the Great Pyramid, which was built for Cheops.